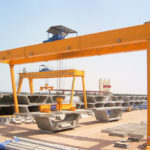 Mobile boat lift, also known as boat hoist, is a sort of flexible, effective and safe lifting equipment used to lift and move various ships. It is extensively found in shipyards, marinas, water recreation center, yacht clubs, navy and so on. The boat lift supplied by our company is capable of handling a substantial amount of weight, usually in a range of 25 tons to 1200 tons. The boat lift crane is designed with a variety of steering modes, which enables it to travel freely within the working areas. At our company, you can find a boat lift with the right features, capacity and size so as to carry out your tasks perfectly. 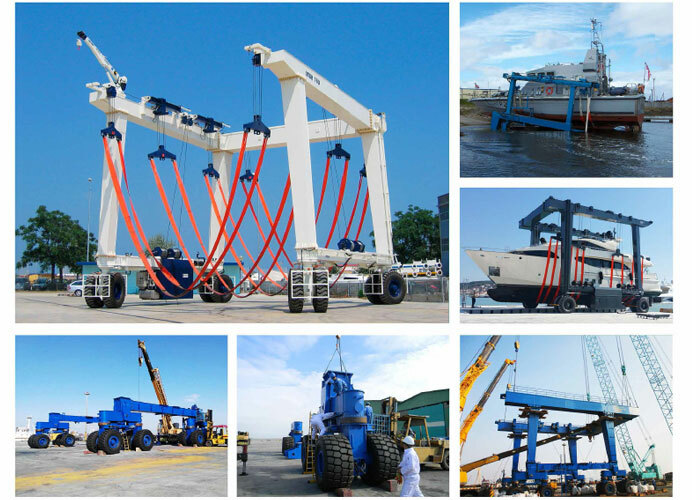 The boat crane with flexible design makes it highly efficient in boat handling process. The boat lift span can be adjusted freely in order to accommodate your boat configurations. 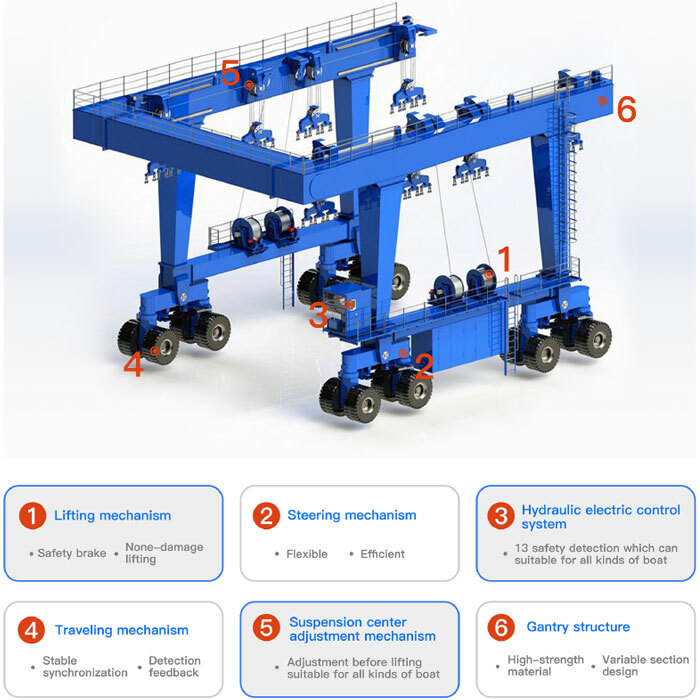 The distance of the lifting point can be adjusted to maintain the synchronous lifting, and at the same time, the power is output based on the load conditions, so that the power consumption of the whole machine is reduced. The mobile boat crane lift can be fitted with various steering modes in order to move freely in your yards, such as fixing axle steering, 90 degree steering and Ackermann steering. There are two main types of boat lift controls, including remote control and cabin control. The selection of control mode is largely determined by the working environments, your preference and financial considerations. Generally, the mobile boat lifter is designed with hydraulic drive system. We are also capable of designing an economical electric drive for your small boat crane, such as 25 ton travel lift, 30 ton travel lift and 50 ton marine hoist. Backed by well-experienced marine hoist engineers, we can offer bespoke solutions according to your particular requirements. 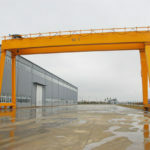 The boat gantry crane uses soft but sturdy slings, which will not cause damage to its surface and structure. It can be designed with various steering modes to fit different working conditions. It can travel at 4% maximum slope when fully loaded. It can handle the boats quickly to save the yard space. 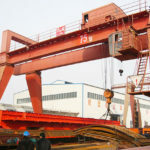 This non-standard crane is self-powered. 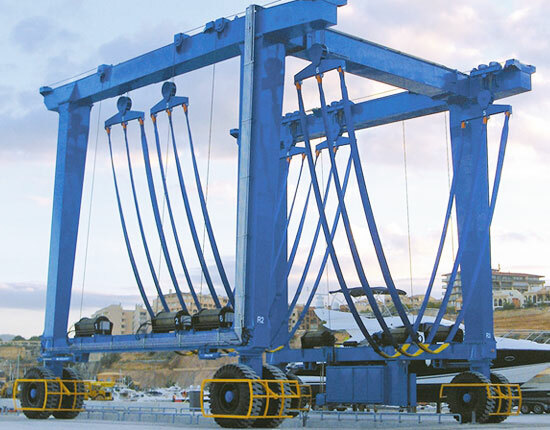 The hoisting mechanism utilizes load-sensitive hydraulic system. The main beam and end beam are articulated in order to eliminate the structural stress when travelling on uneven road surface. 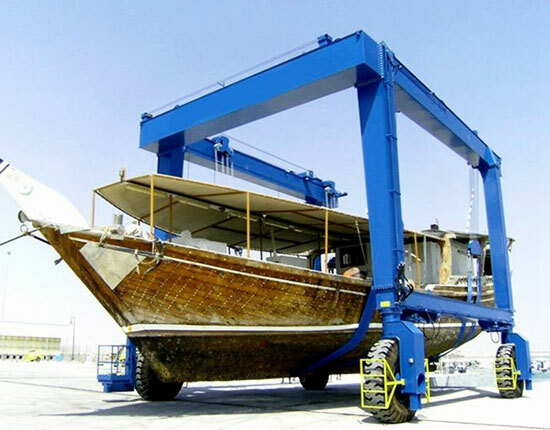 The mobile boat crane is specifically designed to lift boats in and out of the water as well as transport in the yard for the aim of boat repair and maintenance, launching for newly-built vessels, transporting from one place to another. For limited yard space, the boat lift can move and position these boats in a row for increased utilization of yard space. This boat travel lift delivers flexible movement, safe and reliable performance and great efficiency, making it a perfect choice for vessel handling in small to large shipyards, marinas and commercial yards. 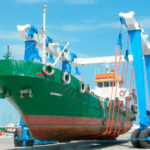 The marine travel lift can carry out many different tasks, mainly including the lift-in, lift-out and transportation work. It is indeed important to ensure a safe lifting operation . The control mode is available in two main types, remote control and cabin. Each of them has its particular features and advantages. The remote control is more suitable for light duty boat lift, such as 25 ton, 50 ton and 75 ton marine lift. 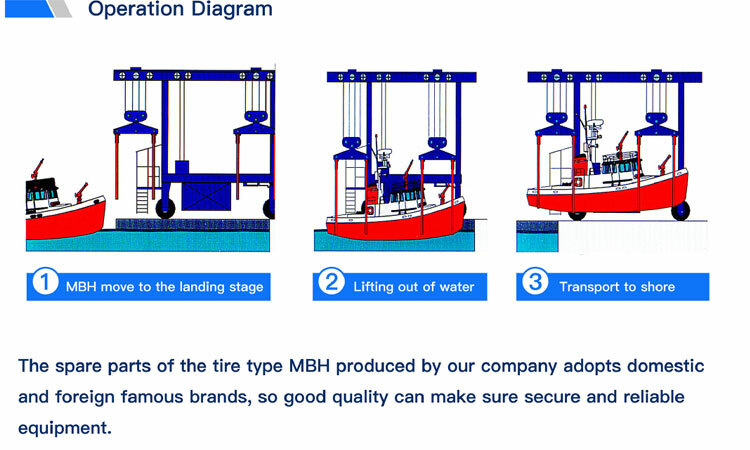 For large capacity heavy duty travel lift such as 300 ton travel lift, 500 ton travel lift and 800 ton boat lift, cabin control is a preferred option. Before commencing any lift, you should check the critical parts of the machine to make sure they are in good working conditions, such as travel lift slings, tires, wire cable and strap pins. Personnel in the working area should be restricted to those who are required for the operations. Never exceed the rated capacity of the boat lift. After the lift, the crane should be parked aside for water drainage. 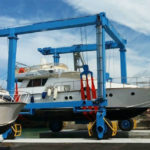 Maintain your marine boat hoist periodically to extend its life. 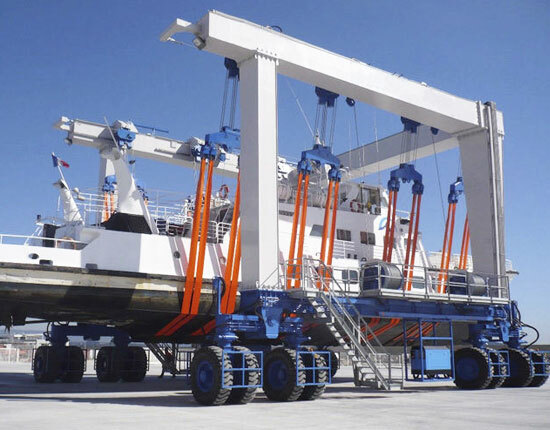 When your vessels to be handled approach 25 tons to 1200 tons, you will need a mobile boat lift that is specifically engineered to do such work. If you buy a travel lift from us, you can find a suitable solution that provides proper balance between efficiency, suitability, durability and cost. Besides, our boat hoists can be tailored to meet your specific needs. 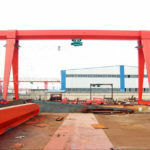 With a wealth of experience in boat lift industry, we offer our customers the crane design, fabrication, delivery, installation and maintenance. You can also receive a boat travel lift at the most competitive price. 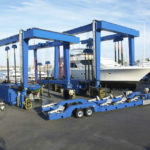 Looking for a quality mobile boat lift? Contact us today!